IPL 2019 | What Have the First Set of Games Shown so Far? With every team having played a minimum of 5 matches in the 12th edition of the Indian Premier League (IPL), certain trends and patterns have emerged from the 23 games which have been completed thus far. Interestingly, SRH and KKR are the only two teams that feature in the top 4 (after 23 games) in all seasons since 2016. Win the Toss and insert the opposition – that seems to be the mantra so far in this edition of the IPL. Captains have preferred to chase in 20 of the 23 matches so far. This means that teams winning the toss have opted to field first in 87% of the matches in this edition. This has remained the preferred choice for captains in the last few seasons too. The corresponding percentage for 2016 and 2017 was 78.26% (18 of 23) and for 2018 it was 91.30% (21 of 23). 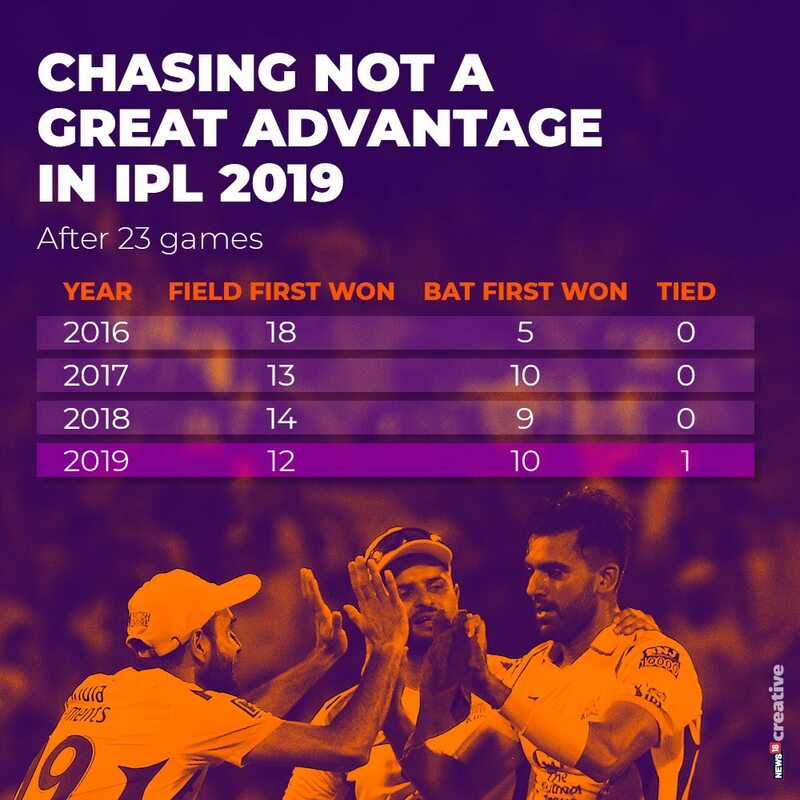 But chasing has not really been an advantage in 2019. Of the 23 matches so far, 12 have been won by the team chasing and 10 by the team batting first. This is in sharp contrast to the previous editions where chasing was a definite advantage. Success Percentage (for teams fielding first) in 2016 was 78.26%, 2017 was 56.52% and 2018 was 60.87%. It’s the lowest in 2019 at 52.17%. The Powerplay run-rate has fallen dramatically from the last edition. Teams scored at a collective strike rate of 143.38 in 2018 – this has fallen to 125.66 in 2019 – a very significant fall of 12.36%! 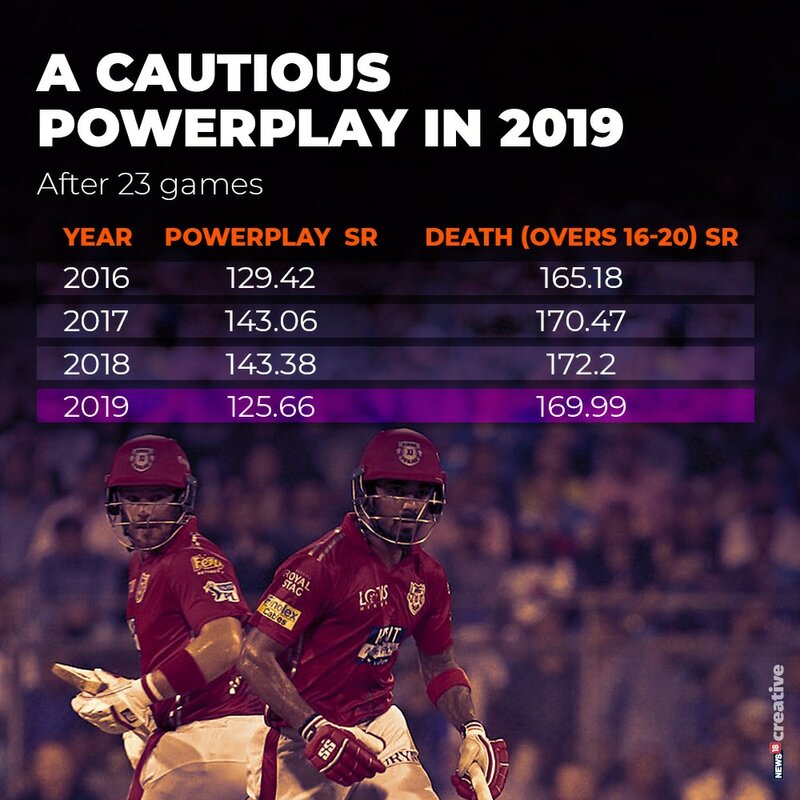 In fact, the powerplay strike rate in 2019 has been the lowest amongst the last 4 editions. The strike rate at the Death (overs 16-20), however, has not seen much change in the last three editions – a very marginal fall has emerged this year. The death strike rate in 2019 is almost equal to the average of the previous three editions. However, 2019 has broken a definite pattern. There was a small but constant increase in run-rate at the death from 2016 to 2017 to 2018 before the slight fall in 2019. Interestingly, it is CSK, the franchise which is on top on the points table, who have, by far, been the slowest team in the powerplay. Shane Watson (106 runs in 6 innings at a strike rate of 119.31) and Ambati Rayudu (76 runs in 6 innings at a rate of 74.50) have struggled at the top. The impetus has mainly come from Dhoni at the Death. There is a gap of more than 15 runs (per hundred balls) between CSK and the second-slowest team in the powerplay– RCB. 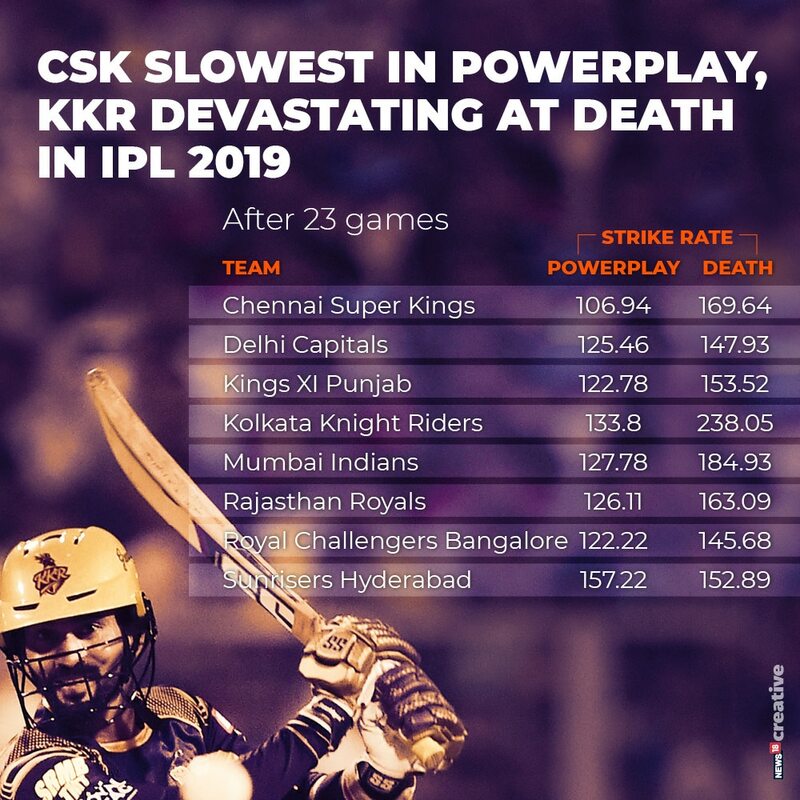 Not surprisingly, KKR have been devastating at the death with a mind boggling strike rate of 238.05. This is largely due to the brilliance of Andre Russell who has scored 257 runs in 5 innings at an incredible strike rate of 212.39! There is a disparity of almost 54 runs per 100 balls in the death strike rate of KKR and MI (184.93) – the second-best on this count. Playing at home continues to favour the local team in this edition too – factors such as familiarity of pitch and the dimensions of the ground, know-how of conditions and a strong and passionate crowd support are some of the factors that add to the home advantage. The percentage of success for Home teams after the first 23 games in 2019 is exactly the same as the corresponding percentage in 2018 – 60.87% (14 wins). This percentage was at 65.22 % in 2017. The edition before – 2016 – hadn’t seen a great start for the home team with away teams winning 13 of the first 23 matches. 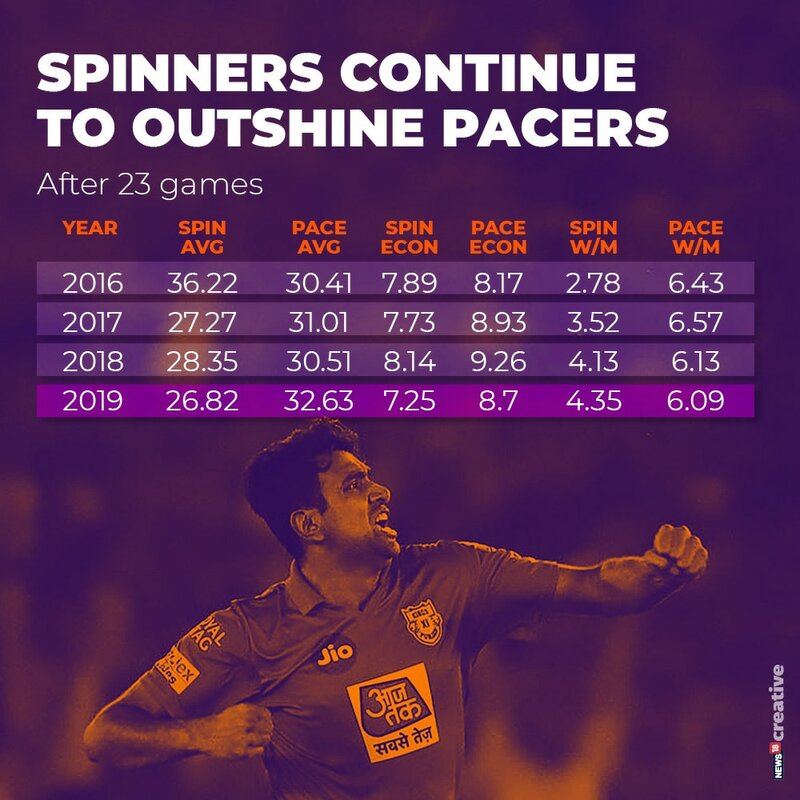 Spinners have performed far better than their pace-bowling counterparts in IPL 2019. While the bowling average for the spinners (at this stage) is the best (in 2019), the average for the faster men is the worst in this edition. Spinners have also been the most restrictive in IPL 2019. In fact, there is a fall of 0.89 runs per six balls in the economy rate of spinners in 2019 as compared to the last edition – a massive change! Even in terms of strike rate, the ratio of wickets per match (pacers to spinners) is the lowest in 2019 amongst the previous 4 editions suggesting that not only are spinners keeping a tight leash on the batsmen but have also become threatening wicket-taking options. There are as many as four spinners in the top 5 bowling averages list thus far in IPL 2019. Harbhajan Singh has been exceptional with the ball having picked 7 wickets in 4 innings at a stunning average of 11.71. He is followed by Mohammad Nabi (12.42), Shreyas Gopal (12.75) and Imran Tahir (13.11). Kagiso Rabada (15.90) is the lone fast bowler on this list. Harbhajan has been the most restrictive bowler of the season too having conceded just 5.12 runs per over. He is followed by Tahir (5.36), Nabi (5.49), Ravindra Jadeja (5.6) and Rashid Khan (5.83). Deepak Chahar, the seamer from CSK, who has earned a reputation for his brilliant bowling in the powerplay this season, follows at number 6 with an economy of 5.95. We compare the best Indian batsmen/bowlers with the best overseas batsmen/bowlers over the last 4 editions of the IPL (top 10 in each category in terms of averages, min. 3 matches played). While the Indian batsmen dominated the averages in 2016 and 2017, that trend changed last year and the best of overseas batsmen continue to better the performance of their Indian counterparts this year too. There has also been a constant increase in the gap between the strike rate of the overseas and the Indian batsmen (barring 2017 which was an exception). This difference at almost 18 runs per hundred balls is the highest in 2019. There have been more substantial scores registered by overseas batsmen in 2019 as compared to any of the previous three editions. The top 10 overseas batsmen have 5 more scores between 30-49, 3 more between 50-99 and one more hundred as compared to the top 10 Indian batsmen in this IPL. The three highest run-getters in the tournament are foreigners – David Warner, Jonny Bairstow and Andre Russell. Russell has the highest strike rate in IPL 2019. He is followed by Sunil Narine, Hardik Pandya, Rishabh Pant and Bairstow. It is for the first time (in 2019) in 4 editions that (after 23 games) the overseas bowlers have a better bowling average and strike rate than the Indian bowlers (average 18.62, 19.14 and strike rate 15.09, 17.41). However, the Indian bowlers have been phenomenally restrictive this year with an economy rate of just 6.60 (in comparison to the overseas bowlers’ economy of 7.40). The Indian bowlers have consistently been more economical over the last three editions. And the difference is even more drastic this year. While the difference in economy between Indian and overseas bowlers has hovered around 0.5 in the previous three editions, it has gone up to 0.80 this year. It would be interesting to see whether there is a change in these trends and patterns as the tournament nears the half-way mark.